Lights Out is a puzzle game consisting of a grid of lights that are either on or off. Pressing any light will toggle it and its adjacent lights. The goal of the game is to switch all the lights off. This package provides an interface to play the game on different board sizes, both through the command line or with a visual application. Puzzles can also be solved using the automatic solver included. View a demo online at http://daattali.com/shiny/lightsout/. Lights Out is a puzzle game consisting of a grid of lights that are either on or off. Pressing any light will toggle it and its adjacent lights. The goal of the game is to switch all the lights off. This package provides an interface to play the game on different board sizes, both through the command line or with a visual application (Shiny app). Puzzles can also be solved using the automatic solver included. Play the game either by downloading the package or online at http://daattali.com/shiny/lightsout/. 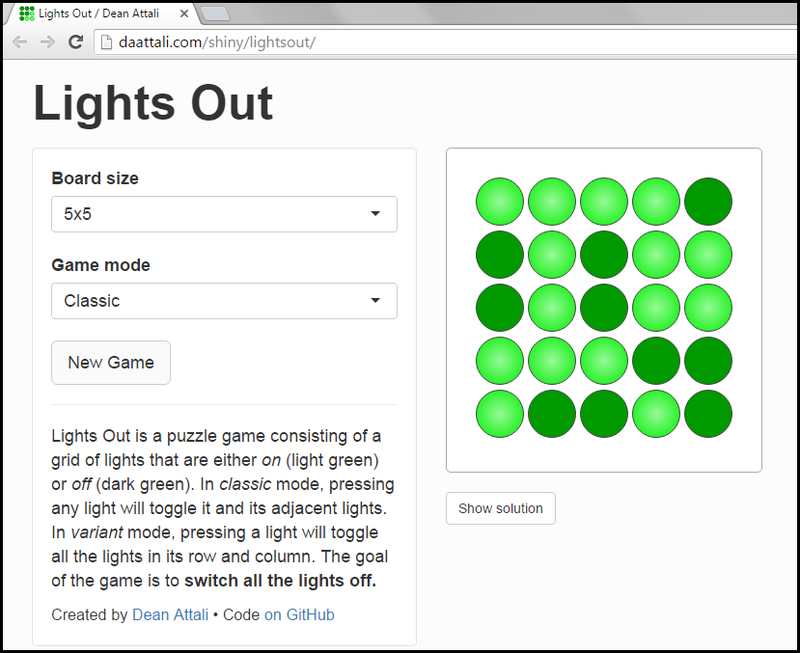 lightsout provides a Shiny app that lets you play with a graphical user interface. To run the game locally, install the package with install.packages("lightsout") and run the lightsout::launch() command. This will launch the provided app in a web browser. Alternatively, you can see the app online at http://daattali.com/shiny/lightsout/. In this image, there is a 5x5 Lights Out board. The darker green lights represent lights that are off, and the brighter green lights are lights that are on. Clicking on the Show solution button will highlight all the lights that need to be pressed in order to solve the current board. Other than the Shiny app that lets you play the game visually, you can also interact with lightsout using the command line. You can use the random_board() function to initialize a new Lights Out game with a random configuration of lights. The generated board is guaranteed to be solvable. The first argument to the function is the board dimensions (number of rows and columns), which is restricted to be either 3, 5, 7, or 9. You can also use the new_board() function to create a new board if you want to provide your own defined set of lights. The first argument is either a matrix or a vector of the lights, with all values being either 0 (light off) or 1 (light on). If a vector is provided, then it is read row-by-row rather than column-by-column. Any board generated by random_board() is guaranteed to be solvable, but since we defined this board ourselves, it's a good idea to make sure it's solvable before attempting to play it. Notice how the light at (2,3) and its 4 neighbours are flipped. If you want to play the non-classic game mode, where pressing a light toggles the entire row and column, then use the classic = FALSE argument of either new_board() or random_board(). To demonstrate, here is the same board initialized as non-classic mode, with the same light being pressed. Notice also that lightsout works well with the %>% operator that allows you to easily chain calls. By the way, when pressing multiple lights, the order does not matter. Pressing y after x will always have the same result as pressing x after y. Another way to press many lights with one call is to use a matrix instead of rows and columns. The matrix must have the same dimensions as the board, and every position in the matrix with a value of 1 means that the light in that position will be pressed. Now let's try to actually solve the board. The board we have is actually super easy - it should be obvious that a single press at (3,2) will turn off all the lights. #> Good job, you won! If you have a more complex board, it will generally require many more presses and will not be as trivial to solve. Let's create a random board of size 5. This one isn't so simple, is it? You can try playing with it for a bit. There are a few algorithms for solving Lights Out puzzles. This package (specifically the solve_board() function) implements the Gaussian Elimination technique, which uses linear algebra to solve a matrix equation Ax=b in order to derive the solution. The matrix operations are done in modulus 2, with b being the current board configuration, x being the solution vector, and A is a special matrix that depends on the board size and game mode. The reason that only boards with an odd number of rows/columns are supported is simply because I couldn't figure out how to derive the special matrix A for even-sized boards. The Gaussian Elimination strategy does not guarantee the minimum number of steps, and therefore some steps in the suggested solution may be redundant. If you are interested in more details about how this puzzle is solved mathematically, you can look at the source code or look at resources online for the exact details of the algorithm and the mathematical theory behind it. I hope you enjoy this little game fully implemented in R, or get inspired to create Shiny games!